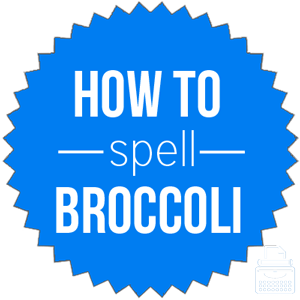 Spelling of Broccoli: Broccoli is spelled b-r-o-c-c-o-l-i. There are two “c’s” and only one “l” and one “i”. Definition of Broccoli: Broccoli, (Brassica oleracea), is a plant in the mustard family that has thick clusters of green—or sometimes purplish—flower buds that look like tiny trees. The flower-like clusters are eaten before the flower buds open. Broccoli is classified as a vegetable. Broccoli is eaten cooked, raw, or mixed with other vegetables and is an ingredient in various recipes. Broccoli is native to the eastern Mediterranean and Asia Minor, and it was most likely introduced to the USA in colonial times. It is one of the most nutritious of the most common vegetables. Pronunciation of Broccoli: Broccoli is pronounced brock-ih-lee. Some people pronounce it brock-lee. What does broccoli mean? Broccoli is a noun and can function as a singular or plural noun. Broccoli is a green vegetable that looks like a tree and has dense green florets attached to the stem. Broccoli is consumed before the florets open. I love most leafy, green veggies except broccoli! Before she told me about it, I never would have thought to put cheese on broccoli. The only way I can get my son to eat broccoli is by covering it with onion dip. The first known use of the word broccoli was in 1699, according to Merriam-Webster’s. Broccoli is the Italian plural form of broccolo, the flowering top of a cabbage or turnip, and the diminutive of brocco, meaning a small nail, sprout. Ultimately, brocco comes from Vulgar Latin brocca, meaning spike. Broccoli is the name of a specific food, and thus, there are no synonyms that can be substituted. Broccoli is a green plant that is highly nutritious vegetable with florets attached to its stem. It is eaten raw or cooked with other dishes.